2. P, Q and R started a business in partnership by investing Rs. 15000, Rs. 20000 and Rs. 24000, respectively. P left the partnership after 4 months taking back the original amount he invested. At the end of the year, P, Q and R received their profits. Q received a profit of Rs. 2000. How much profit P would have received if he had continued till end of year assuming the annual profit to have increased proportionally? 3. If the ratio of speed of doing work of three persons is 1 : 3 : 5, what is the ratio of time taken by these people to do the same amount of work? 4. A person had a certain amount. He invested 5/6th of it in shares, 5% of it in mutual funds, 10% of it in debentures and kept the remaining Rs. 850 with him. If got interest at 10% for a year on debentures, what amount did he get as interest? 5. A family consists of paternal grandparents, parents and three grandchildren. The average age of the grandparents is 70 years, that of the parents is 40 years and that of the grandchildren is 10 years. What is the average age of the family? A Report on the no. 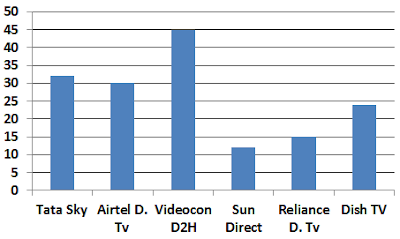 of subscribers of different DTH companies in a city in a year. Total no. of subscribers of the six DTH companies = 60000. 6. What is the total no. of HD subscribers of Dish TV and Tata Sky together? 7. The total number of HD subscribers of Reliance Digital TV is what percent of the total number of HD subscribers of Videocon D2H? 8. What is the average no. 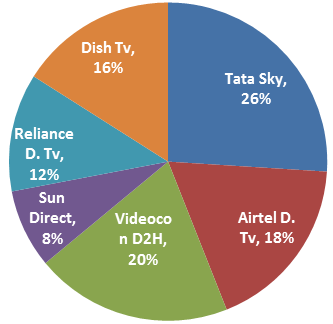 of HD subscribers of Dish TV, Sun Direct and Videocon D2H? 10. What is the difference between the no. of HD and Non - HD subscribers of Airtel Digital TV? 11. 9/42 ÷ 108/63 × 328 – 5/7 + 7/5 = ? 14. 18% of 256 + 35% of 290 – 15% of 385 = ? 4. C) 5/6 corresponds to 83.33%. Also, because he placed 10% in debentures and he got 10% interest, amount obtained in interest = 10% of 10% of amount with him i.e. 1% of the amount with him. 5. B) The family consists of grandparents, parents and three grandchildren. ∴ The total age of the family members = 140 + 80 + 30 = 250 years. 10. B) Given, Total no. of subscribers of the six DTH companies = 60000.